Meco (Domenico Monardo) launched the space disco era with Star Wars and other Galactic Funk (1977), which went platinum. He followed with several disco-ized soundtrack albums, including Encounters of Every Kind (1977), Superman and other Galactic Heroes (1978), and Christmas in the Stars: Star Wars Christmas Album (1980). Music from Star Trek and The Black Hole (1980) didn’t go over well. The movies bombed at the box office, and the original, now classic soundtracks (by Jerry Goldsmith and John Barry, respectively), resisted the transition to upbeat funk. Meco knew it, and faked most of The Black Hole. The main theme is the only track that clearly resembles Barry’s score. 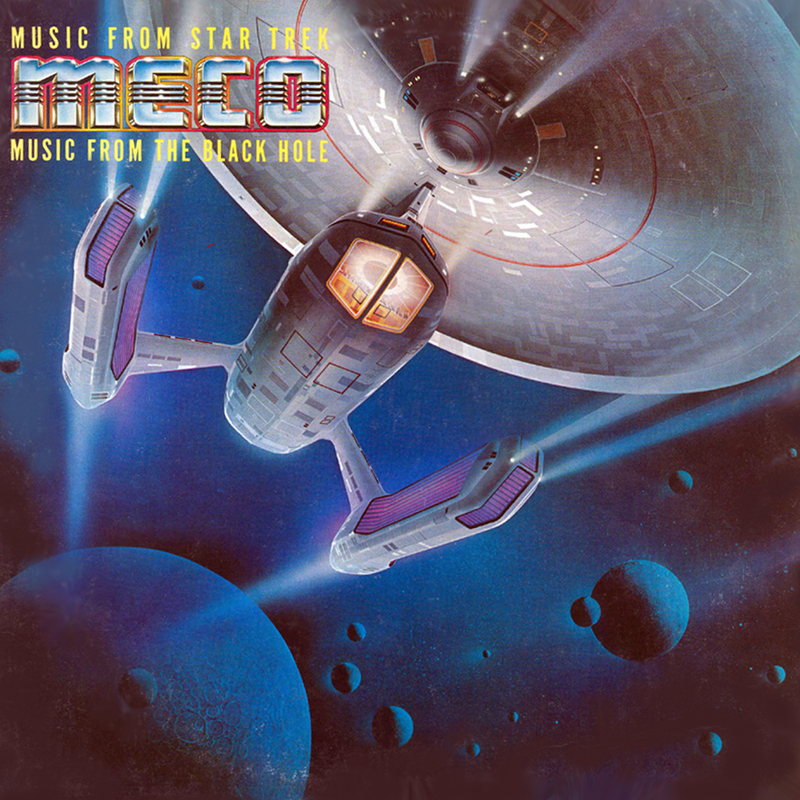 You can listen to Meco’s “Star Trek Medley” here. The entire Black Hole suite is below. The album art is by Shusei Nagaoka, who did many memorable sci-fi-themed covers throughout the ’70s, including Out of the Blue (ELO) and Raise! (Earth, Wind & Fire). 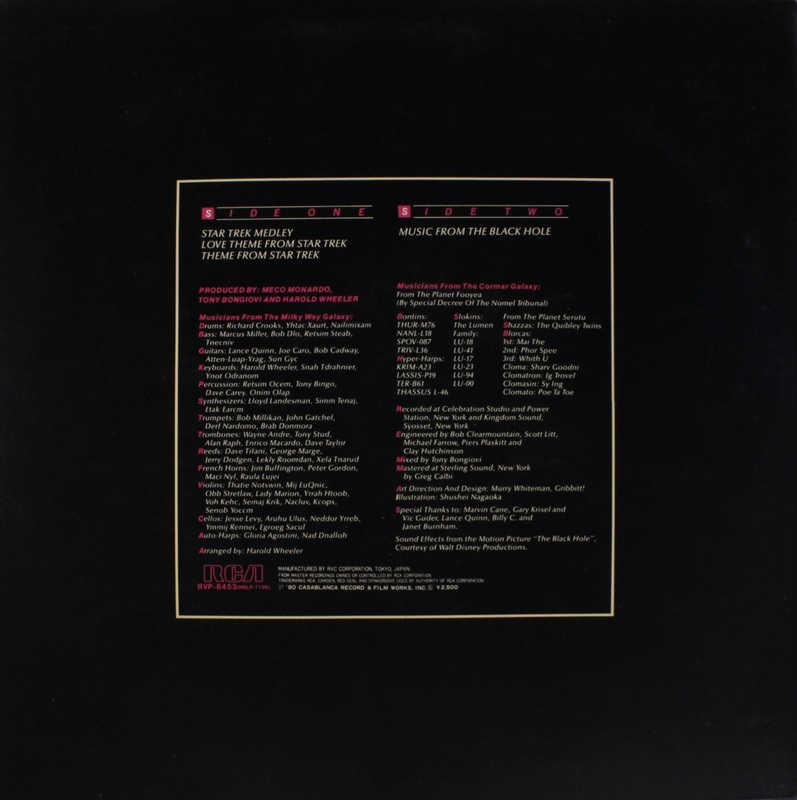 A German group called Nostromo, following a very curious disco version of the Alien theme in 1979, released a 7″ called The Black Hole in 1980. It’s much more faithful to the original, although I like Meco’s misdirected space-funk a little bit more. I need more Black Hole Disco in my life. Can this be purchased on iTunes? It’s not available anywhere, as far as I can tell. You can get Meco’s Star Wars album, and a “Best of” compilation, but that’s it for the sci-fi stuff. Very sad. How is that Tomita album? Is it ambient? Not really. Like most of his work, it consists of arrangements of ‘classical’ pieces for his battery of analogue synthesisers and effects. ‘Space Walk’ is a bit sneaky in that it culls pieces from other Tomita albums and essentially gives them new titles. Debussey, Prokofiev, Ravel and Mussorgsky are all Tomita-ed effectively (if you like his style!). Very cool, thanks. Enjoying your site! Just liked it on Facebook. Cool. For some reason I’ve always associated that Eurythmics song “Here Comes The Rain Again” with The Black Hole. Maybe I heard it on the radio around the same time I watched The Black Hole on TV or something. Anyways, old vinyl is the best. I highly recommend the 2001: A Space Odyssey vinyl LP soundtrack. Seek it out. Have you seen Martin Kennedy’s site? Apparently I have another collector’s item, because I have that same gatefold 2001 LP. I think my Dad said that he bought movie soundtracks to test out (show off?) his stereo equipment. He was a bit of an audiophile. I also have Star Wars and various James Bond soundtrack LPs. He had good taste. Any record collection that features those early Bo Diddley Chess Records LPs and Bob James One (Nautilus!) is pretty cool in my book. I must confess I love Meco’s Star Trek renditions. But as was already stated, the stuff from The Black Hole doesn’t even sound like anything from the film.